Find Blackstone 28 inch Outdoor Flat Top Gas Grill Review. Are you planning to get a quality grill that will give you a wonderful experience during your grilling and outdoor experience? Well get the Blackstone 28 inch grill. Blackstone is not just any grill, but it’s one of the best grills that is consumer friendly and its fairy priced. 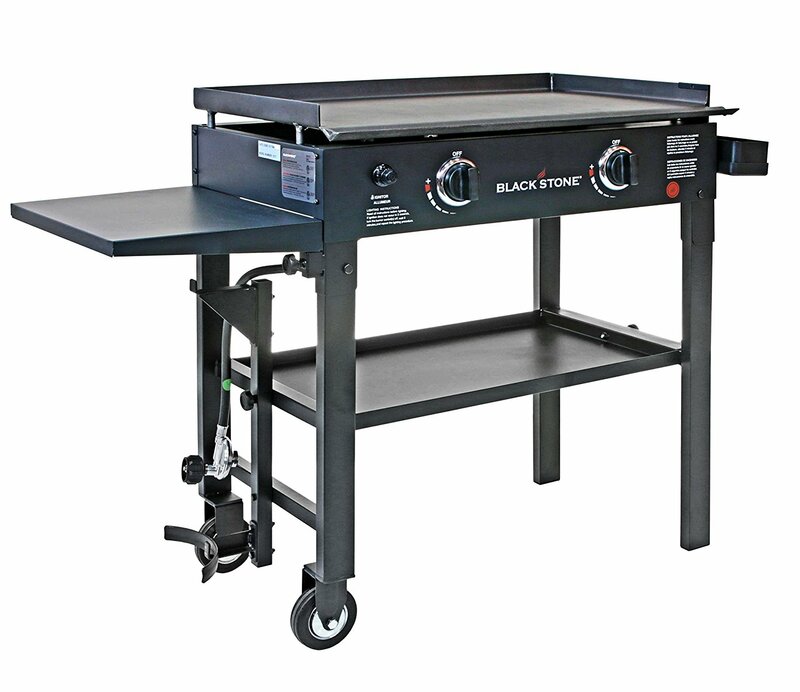 Blackstone is preferred by many because of the flat top design that introduces change from the normal grilling style to more modern grilling method. In addition to the flat top design, this grill has two steel burners that are stainless steel. Each burner contains enough power that can allow you to cook tasty food without much pressure. 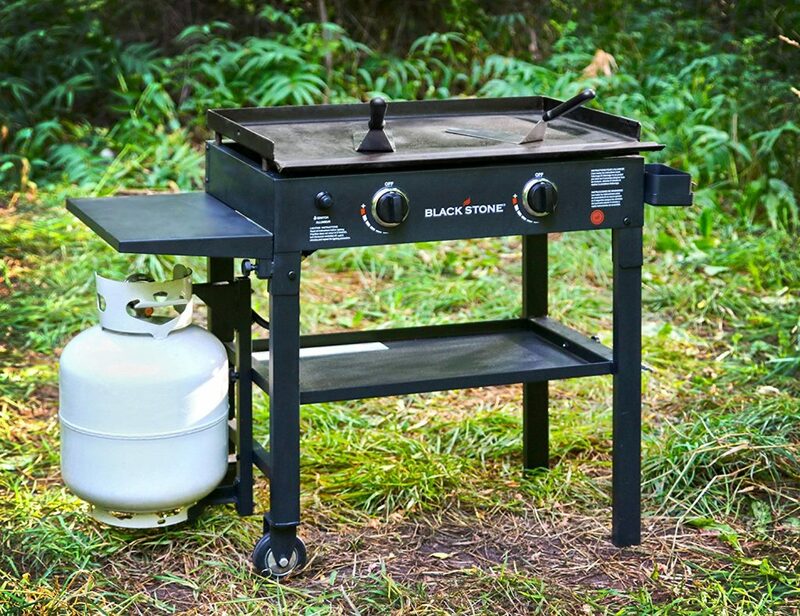 Another feature that makes Blackstone grill is that it has strong steel base which makes the grill long-lasting. The flat top ensure that one has enough space to move the meals easily. The simple, but quality make of these grill means less space will be occupied hence can be used in a backyard that is not that big. The price of Blackstone is only affordable, and you will be assured quality for your money. Two stainless steel burner with capacity to pump out 30,000 BTU of cooking ability. Each burner has a capacity of 15,000 BTU of cooking power. Easy to clean due to the steel flat top compared to the traditional grill that required cleaning in between the round steel. Ability to control the heat through the two burners. Extra shelf that give room for more cooking area. Lack of the lid reduces the chances of smoking as method of cooking. As this grill is targeting the budget customer, design is also not very sophisticated. The manufacturer priority is to bring a good quality grill that can provide grilling experience without much pricing. . However with the extra lower space provided by the lower shelf and the excellent burner the grill is go to go. Blackstone 28 inch weighs 80 pounds and to ensure mobility it has wheels. For travellers who are in constant journey and tour, this grill may be good as it can be mobile. The stainless steels ensure the grill last long with no chances of the grill getting rusty. Compared to other high priced grill, this one may not beat the complexity but it will definitely give expected services within its price range. The difference between a flat top and an average grill grate surface cannot be overstated as this grill is truly unique especially at such a low price. The individual burners give pretty good heat coverage and a powerful punch. If you are on a budget looking for a family, sized grill the expansive 470 square inches should suit you quite well. That is not the grill to buy for someone who is about style unless they just want to cook with it, showing off their skills with cutlery on a wide open range. A good quality bargain product for the chef minded cook. The unpleasant part about this grill is that being a lower end grill, it lacks outlines on is how the manufacture will award warranty. However, the maker gives coverage for any flaws of workmanship issues for only ninety days after purchase.